We hit our 5 year gluten and dairy free “anniversary” on Monday! 5 years ago on the 15th, we gave Sophie her 2 year old birthday cake, and the next day went cold turkey at the recommendation of her developmental pediatrician. Some things were easier to adapt to than others (5 years ago the gluten free bread situation was ROUGH. Also: CHEESE.). One thing I really missed was a really, REALLY good chocolate chip cookie. 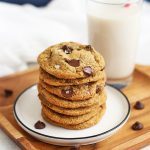 I’ve had some very good ones over the years, so it was disappointing that so many of the gluten free chocolate chip cookie recipes I tried were…lackluster. As a newbie to GFDF baking (when paleo and gluten free blogs were scarce), I had a LOT of trial and error to figure things out. Emphasis on error. 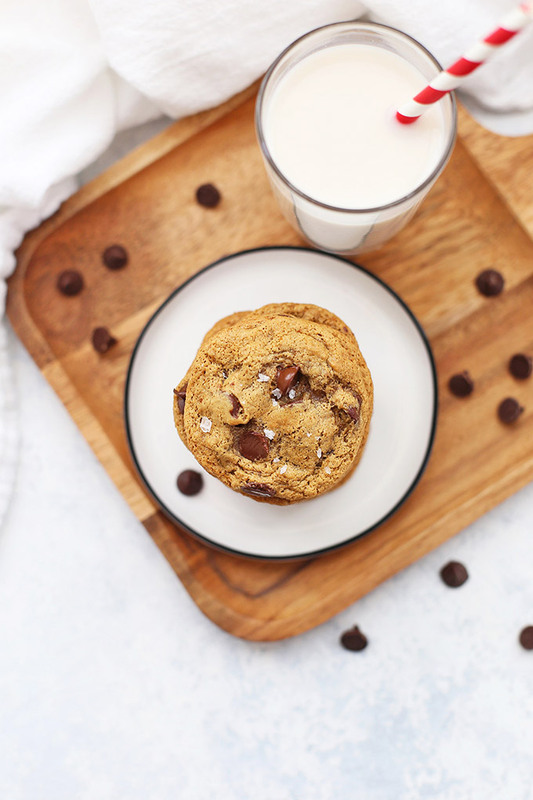 Finally, we landed on this amazing gluten free, dairy free chocolate chip cookie that hits all my favorite things–lightly crispy and caramelized around the edges with a soft, chewy center and PLENTY of chocolate chips. 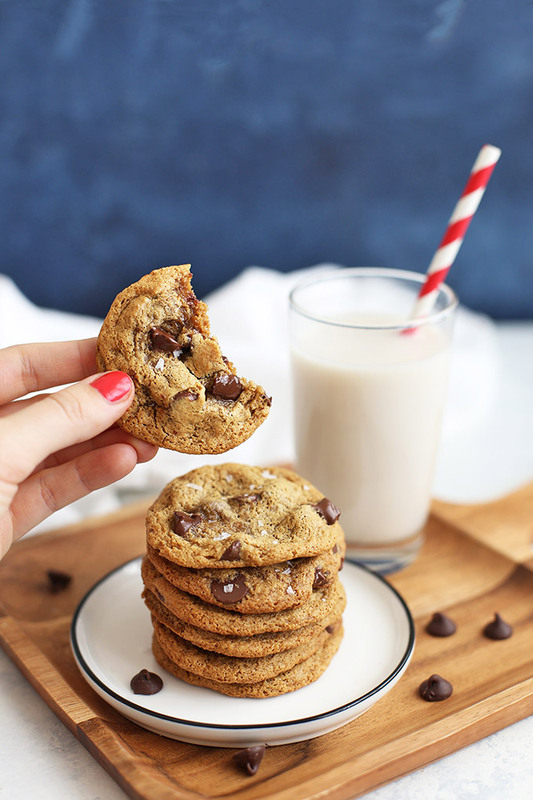 These almond flour chocolate chip cookies are the REAL deal. The combination of almond flour and brown rice flour (or tapioca flour) makes the texture the perfect combination of chewy and light. They aren’t crumbly or dry, and bake up like a dream. Enjoy them on their own, make ice cream sandwiches with a little dairy free ice cream in between two cookies, or dunk them in a little almond milk. 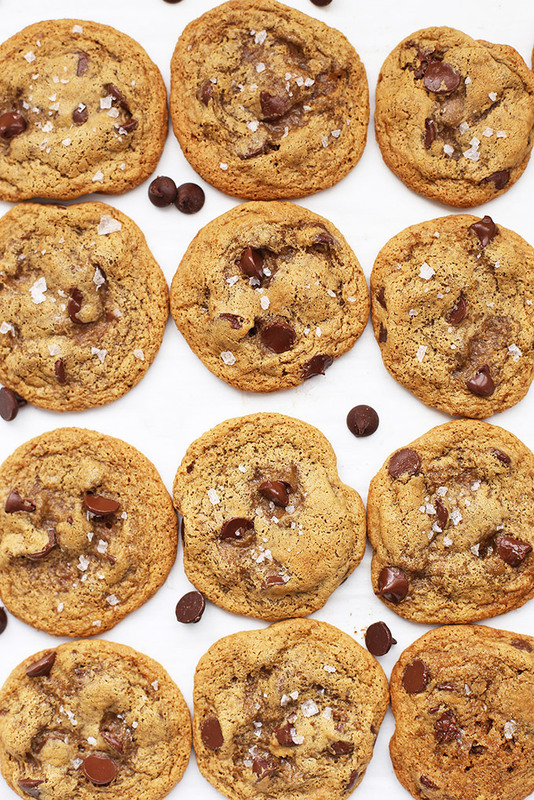 They’ll make all your (gluten and dairy free) cookie dreams come true! Almond Flour Matters – We’ve tested this with MANY kinds of almond flour over the years. I recommend looking for blanched almond flour. It’s finer ground and doesn’t have the almond skins like almond meal does. A few brands we like are: Honeyville, Hughson, Wellbee’s, and Blue Diamond, . I always recommend looking at Costco. At my Costco, I can get a 3-lb, bag of almond flour for $10-11, where at Target, Kroger, and even Sprouts, it’s about $9 for a 1-lb. bag. (Woof) Amazon is another great place to look. Please Don’t Substitute Coconut Flour – Every time I post an almond flour recipe, someone asks me if they can substitute coconut flour. PLEASE don’t do that in this (or any) recipe. Coconut flour absorbs several times its own volume in liquid, which means you need many more eggs/much more liquid ingredients in a coconut flour cookie. If you try to substitute coconut flour in this recipe, your cookies will be dry as a bone and probably won’t even stick together. Paleo Notes – You can easily make this cookie paleo friendly by using tapioca flour in place of the brown rice flour. I’ve used both flours with great results. I prefer the brown rice flour, but if you’re grain free, tapioca is the way to go! Need Dairy Free Chocolate Chips? Enjoy Life makes good ones that are more and more widely available. The ingredient list is short and sweet, and no one can tell the difference. Pinky promise. A Little Something Extra – It’s optional, but I *highly* recommend adding a little coarse flaked sea salt on top right after they’re done baking. I love Maldon salt, and use it for finishing veggies, mixing into my Everything Bagel Seasoning mix and sprinkling over brownies, cookies, etc. SO GOOD! Don’t Overbake. I usually pull mine out at 8 or 8 1/2 minutes. They’ll be just set around the edges and the centers may not look quite done. Pull them out and let them sit on your baking sheet for a few minutes. The residual heat will finish setting the centers, giving you the perfect “chewy on the outside, soft on the inside” texture you’re looking for. In large bowl (or in the bowl of a food processor), combine coconut oil and coconut sugar. Mix well to combine. Stir in egg and vanilla. Mix until very smooth. Add almond flour, brown rice (or tapioca) flour, baking soda, and salt. Stir to combine well. (If using food processor, add dry ingredients and pulse to combine). Refrigerate dough 20-30 minutes, or until slightly firmed. While dough is chilling, preheat oven to 350 degrees. Scoop 1-inch balls of dough and place on a cookie sheet lined with parchment paper. Bake 12 cookies at a time for 8-10 minutes, or until edges are set and middle is still slightly unset. (the middle will set as cookies cool). Allow to cool on baking sheet slightly before transferring to a cooling rack. Enjoy warm or frozen! *If you can’t find coconut sugar or don’t like it, you can use brown sugar or half white sugar/half brown sugar. (This will no longer be paleo approved). Recipe, photos, and post updated Apr. 2018. Originally posted June 2014. You had me at, ‘tastes a lot like Samoa’s’. Do you think I could use oat flour (I have some to use up) for the tapioca and regular sugar since I don’t use coconut sugar? We’re not on a special diet, but I do love almond meal for the nutrition. Our Kroger now has a store brand that is much less expensive than the Bob’s Red Mill. Oh nice! I’ll have to look at our Fry’s (Kroger-owned) to see if I can find it! As for the substitutions, I’d try subbing brown sugar for the coconut sugar (I think the flavor and moisture content is more similar than white sugar). Oat flour is a bit higher protein than tapioca or brown rice, so the cookies might need to be baked a little bit less so they don’t dry out. I’d love to know how they turn out if you try them! Oh good! I’m glad you liked them!!! Where do you buy your coconut oil? I’ve still never tried it! I’m LOVING your comments this morning! They sell coconut oil almost everywhere these days (Target, Wal-Mart, Kroger stores, Trader Joes, Sprouts, Costco, etc.) For smaller jars, I get them at Sprouts because they’re on sale regularly. I use so much coconut oil that I buy the giant Costco size, but for starting out, I’d recommend going small. The brand hasn’t mattered so much. I just recommend getting virgin unrefined. Spectrum and Nutiva are the brands I buy most often, but that’s because they’re on sale and they’re pretty reputable companies. My family and I absolutely love these cookies. We use butter flavor coconut oil and adjust the tapioca starch to double to help them keep their shape. So good! I was curious though, is your nutritional chart for 1 cookie? My nephew has type 1 diabetes and it would be so helpful to know the carb count. Thank you! Larina – I’m so glad you enjoy them! And yes! The nutrition facts are based on 1 cookie (assuming you get 24 out of the recipe). I have been buying items such as whole grain flour, almonds and salt in bulk to save money and reduce the times I have to go shopping. 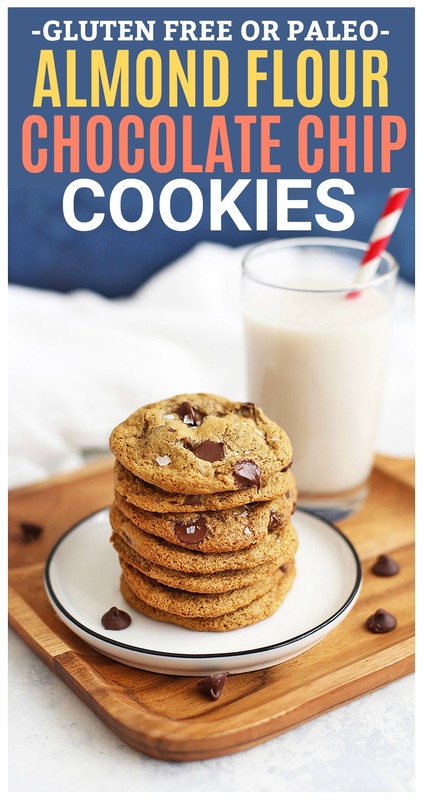 These cookies look absolutely yummy and I can’t wait to try the recipe. I will need to get the chocolate chips. I can’t attach the pic, but I tried doing these today and didn’t get as good results as the ones in your pics. I did make some variations though and wanted to know how they affected my results. And since I saw it was crumbly, I used 1/3 cups of almond milk to hydrate. And didn’t use the cocoa powder, but the cacao grains, which I made powder and included in the mix. Laura Alanis – I’m sorry the cookies didn’t turn out for you! I think that your substitutions are the reason behind the dry cookies. Coconut oil has a thicker, more butter-like texture than olive oil, which will lend more structure to your cookie. Coconut oil is also one of the primary flavors in the cookie, so I think the olive oil will change the flavor profile pretty significantly. Coconut sugar is also crucial to the flavor of the cookie. While you could probably get away with substituting brown sugar in place of coconut sugar, I don’t use any artificial sweetener. As for the flour, coconut flour has a different protein content than almond flour. Coconut flour also absorbs a significant amount of liquid, which is probably why the cookies were so very dry. I’m sure the almond milk you added helped, but coconut flour and almond flour are not interchangeable. I will definitely try doing these again this week. Although I can’t find coconut sugar in Mexico (Monterrey), but I’ll ty with brown sugar. BTW…how long do these cookies last before going bad? 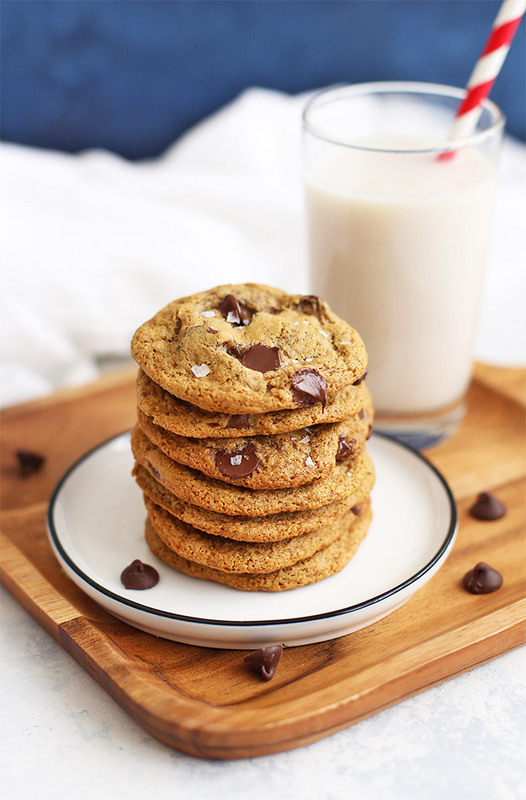 Hey,,, Just for FYI,,, I have made these cookies a few times now. I made them with Brown Sugar instead of coconut sugar and I found that I had to reduce the measurement of sugar from 3/4 cup to 1/2 cup. If not then the almond flour content needs to be increased. When I made them with the ful 3/4 cup of brown sugar the sugar melted and the cookies spread out to a thin wafer. Other than that I want to thank you for this recipe and I hope if I added to to anyone else’s enjoyment of these cookies I am happy. Namaste! Just ordered some of the brown rice flour to try these! What I love is that they still seem nourishing. You know, full of things that are pretty good for you and less things that just taste good. 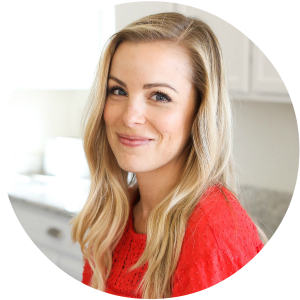 I’m working hard at deciding if my food is nourishing (in mind, body, or soul, because sometimes it’s more about the eating with friends and less about what the food is…) and this is so helpful. I can’t wait to make it! I know what you mean! I totally believe food has more than just one purpose (to nourish), and that it’s sometimes TOTALLY about the joy and enjoyment of eating and sharing together. I love that this recipe does a little of both! Hey, I made these and they are currently chilling in the fridge before baking… I stuck to your recipe (though I wanted badly to use butter :D) and I bought a bag of brown rice flour to use. I don’t use it much so this is my question: how do you store it? Freezer, fridge or pantry? Mouth is watering waiting to try them as ice cream sandwiches tonight after dinner! Amy – SUCH a great question! If you’re not going to use it often, I recommend the freezer. We go through ours within just a couple months, so it’s usually in our pantry, but if you’re going to use it slower, the freezer is the way to go! Can I just say this my first time making gluten-free, dairy free cookies and they were beyond DELICIOUS 😋. Loved how simple the recipe was, they turned out great however I have a quick question as I had to improvise a bit with cutting the recipe in half; all ingredients were fine however I noticed that the mixture was a bit runny so I added in a bit more almond flour and it seemed to do the trick. The cookies were in the oven about 12 mins and were a bit softer than in am use to but tasted just as good as my traditional cookies I make. My question is should I also add a bit more Brown rice flour also or is adding solely the Almond Flour fine for the thicker consistency? Jessica – I’m SO glad you enjoyed them! Almond flour varies a bit in density depending on how finely ground it is. What brand did you use? For thickening the cookies in a half batch, it does sound like you’d want to add a little more brown rice flour along with your almond flour if you’re finding them thinner/spreading wider than you’re used to! Thanks so much for the quick follow-up. I am seriously blown away at home yummy these cookies are. I used Bob’s Red Mill Almond Flour. I will definitely try out the next time I make them also adding in the brown rice. Would you say equal parts or 1/4 brown rice to the additional amount of almond flour that I use? I made these cookies today, subbed out brown sugar and white added walnuts and they were absolutely delicious. 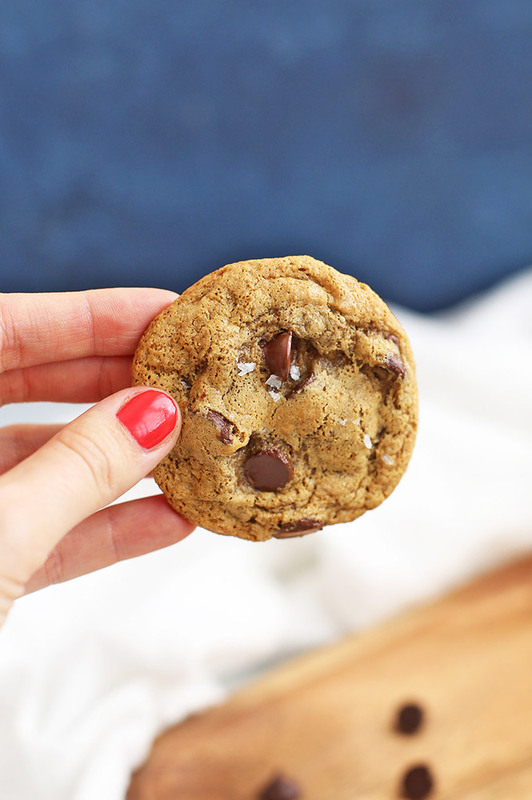 This is the 1st gluten free chocolate chip recipe that I have tried. You rocked this recipe out of the park! Oh my goodness! I’m so happy to hear that! We made a batch today–they’re our FAVORITES! Cookies tasted great!! I substituted cassava flour for almond flour and the texture was perfect! I did have trouble getting my cookies to spread. Any suggestions on how to get them to flatten? Autumn – I’m so glad you liked them! I don’t think cassava and almond flour are 1:1 substitutes, so I think that would probably be why they didn’t spread. I haven’t baked with cassava before, but I’d probably try decreasing the amount of cassava flour to see if that helps. (Typically if they don’t spread, it’s because there’s too much flour). I hope that helps! Delicious on the first go, thank you! Hooray! We made a batch this weekend. It’s our very favorite! Made these cookies using the ingredients provided, very yummy! Though, because there isn’t much rise, I decided to do the second round in a silicone-based cupcake/muffin holder. I kept them in until the tops were nice and brown (about 15mins insead of 8-10), and they formed into little, thick and delicious cookies! Thank you for the great recipe!! What a clever idea! I’ll need to try that sometime! What if you dont have parchment paper? What can you use? Whipped these up because they looked so quick, and i had everything on hand….. and they came out SO FLAT :””'( I don’t know what i did wrong!! Oh man! I’m sorry that happened. Can I ask what kind of almond flour did you use? Sometimes that can make a difference. In the future, if you bake a test cookie and it comes out flat, you can add 1-2 additional Tbsp of flour to the dough to help give them more structure. Sometimes almond flour can measure differently depending on how finely it’s ground or how tightly it’s packed. I hope that won’t happen again!